The Osaka Higashi Line (sometimes called the “Osaka East Line”) is a railway line operated by JR West that runs between Shin-Osaka Station and Kyuhoji Station in the city of Yao. 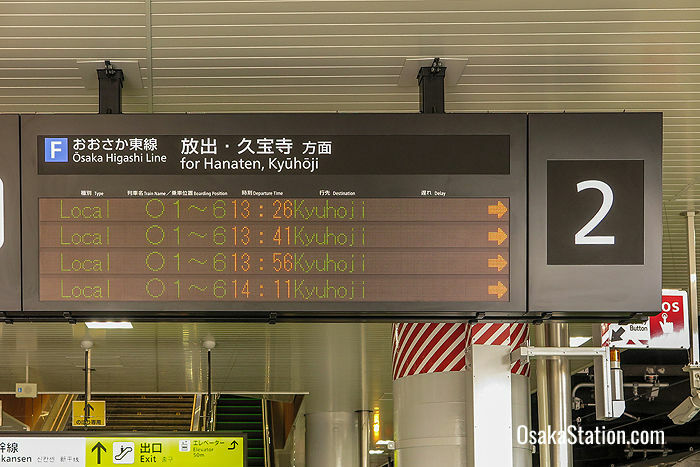 Most services from Shin-Osaka Station terminate at Kyuhoji Station, but some Direct Rapid services continue on the Yamatoji Line to JR Nara Station. At other times, passengers traveling to Nara can transfer to the Yamatoji Line at Kyuhoji Station. At Shin-Osaka Station, Osaka Higashi Line services depart from Platform 2. All services on this line are covered by the Japan Rail Pass. There are 14 stations on the Osaka Higashi Line. There are not many tourist attractions along this line, but there are several transfer points to other lines. All stations with transfer points are listed below with example travel times and fares given from Shin-Osaka Station. Shin-Osaka Station is the northern terminus of the Osaka Higashi Line. Transfer here to Tokaido Shinkansen and Sanyo Shinkansen bullet train services, the JR Kyoto Line, JR Kobe Line, JR Takarazuka Line, JR limited express services, and the Midosuji Subway Line. This station is a 4 minute walk from Hankyu Railway’s Awaji Station where transfers can be made to the Hankyu Kyoto Line and the Hankyu Senri Line. This station is a 15 minute walk from Shirokita Park which is famous for its seasonal flower displays of cherry blossoms, irises, and chrysanthemums. This station is a 3 minute walk from Noe Station on the Keihan Main Line, and 8 minutes from Noe-Uchindai Station on the Tanimachi Subway Line. Transfers can be made here to the Gakkentoshi Line and the Imazatosuji Subway Line. Transfer here to the Gakkentoshi Line. 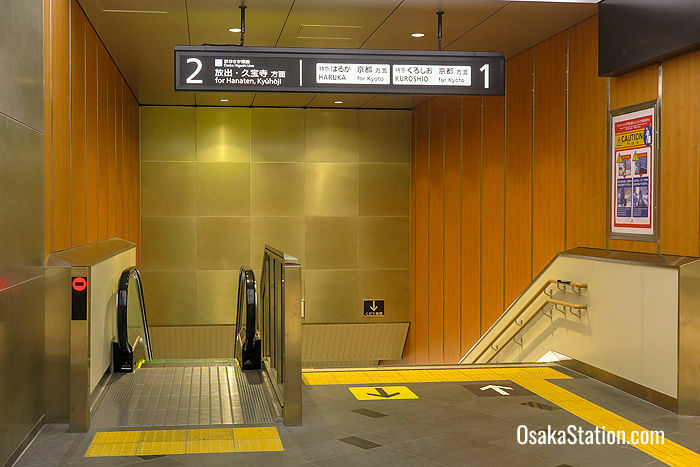 Passengers can transfer to the Chuo Subway Line at nearby Takaida Station. Passengers can transfer to the Kintetsu Nara Line at nearby Kawachi-Eiwa Station. Passengers can transfer to the Kintetsu Osaka Line at nearby Shuntokumichi Station. Transfer at Kyuhoji Station to the JR Yamatoji Line for services bound for Nara. Nara is famous for its many ancient shrines and temples and for the deer that roam freely through Nara Park. Trains from Kyuhoji to JR Nara Station take around 30 minutes. The current timetables are given below. 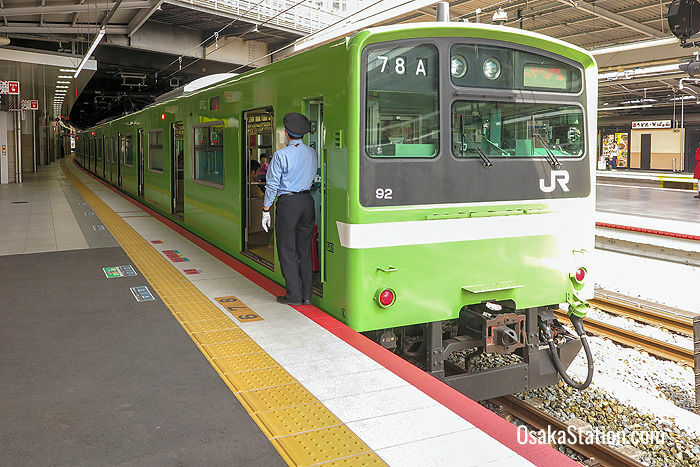 The fare between Shin-Osaka Station and JR Nara Station is 920 yen. At the time of writing there are four daily Direct Rapid services from Nara to Shin-Osaka on weekday mornings. On weekends and holidays there two services in the morning and two in the evening. The current timetables are given below.